Kenny, Tyler and Brock rig one of our boats. 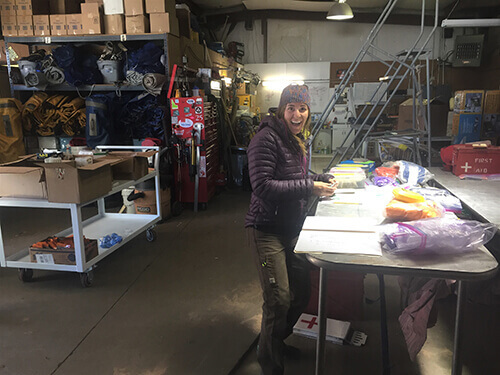 Holly makes sure all the first-aid kits are stocked and ready for the season. 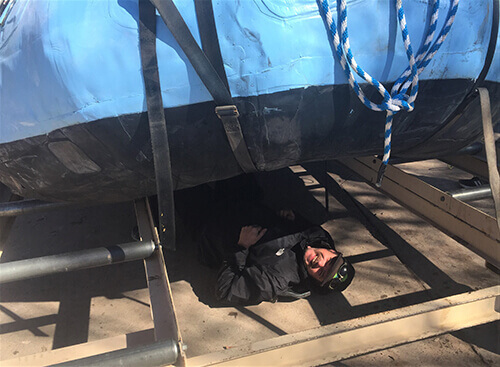 Chris helps rig from below! Our warehouse team is in full swing, gearing up for the start of the season! 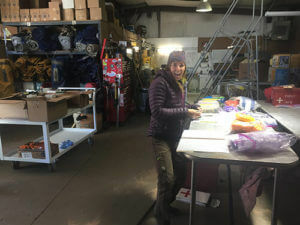 In early March, guides and warehouse crew members begin Spring work: rigging the boats, stocking the first-aid kits and the kitchen and lunch boxes, checking all the gear — tents, dry bags, sleeping bags — and making sure it’s ready for another season in Grand Canyon. Spring work culminates with our annual warehouse guide training session, which will take place at the end of the month. 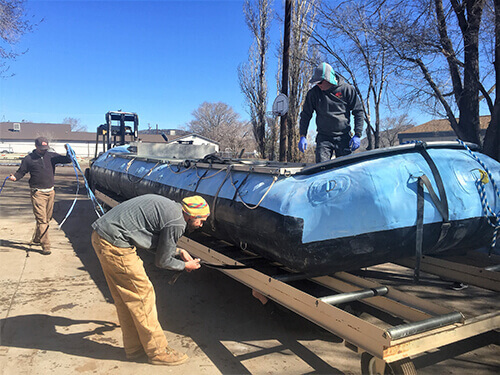 At the training session, our warehouse managers will go over, in great detail, any updates to park regulations, any in-house policy changes, and best practices on the river. They’ll also hold equipment training sessions, where guides will get to practice working on the motors, fixing leaky valves, patching boats, and using our satellite phones, among other things. Guides also will have the opportunity to have any questions about their employee benefits answered at the annual training session. You know the season is just about here when you start seeing guides, one by one, roll back into the warehouse yard in their Carhartt’s. Here’s looking forward to an awesome 2017 season! And if you haven’t booked your 2017 trip with us yet, don’t worry — we do still have some seats available this season.